This is 豆腐脑 and is literally translated to Tofu Brain probably because of the white tofu-ey appearance and texture. 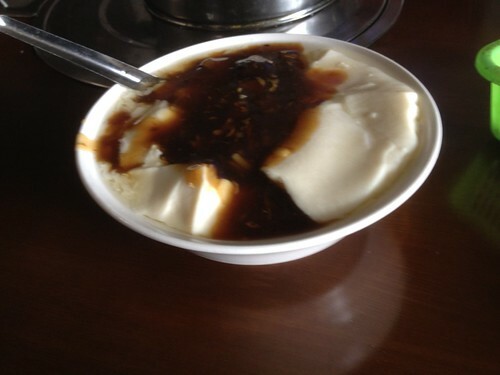 Actually, this is tao huey 豆花 that we are more familiar with except that instead of sweet syrup, they put savoury gravy on top. It is just as yummy and oh gawd, I can feel my blood pressure going up again with this delicious dish. As you can see, the place is in a mess. In fact, the entire restaurant looked like this. The whole bladdy place is in a mess. Eaten bowls, utensils and rubbish are strewn everywhere. The people who sell the breakfast items do not own the restaurant. The restaurant itself serves only lunch and dinner. I guess the owner of the restaurant wanting to fully utlitise the rental and generate extra revenue, lease out the space in the morning to these breakfast hawkers. As such, there is no cleaning staff. 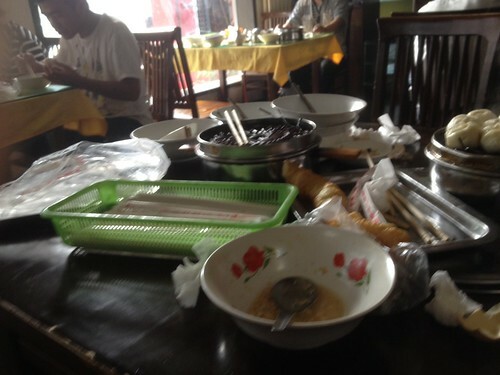 The hawkers will clean up after the last bowl has been sold and returning the restaurant to its original state before the restaurant opens for lunch. It takes a while to get used to eating amongst loads of rubbish. Reminded me of VivoCity kopitiam food court two years ago during Chinese New Year, There were no cleaning staff (probably all went back to Ch1na liao) but the food court remained open. So what you see is stacks and stacks of unclear bowls, crockery and rubbish everywhere.. Very innovative of the restaurant owner. Now, if he can only spare some of his takings for cleaning staff. But then again, if the hawkers will settle it like you said, its a matter of getting used to it. Why waste money? This gravy on tau huey reminds me of ice cream on prata leh. Dunno what to make of it. I doubt if he sees a point in that considering that fact that hiring a cleaning staff will not boost his revenue. So why bother? And yes, I also don't understand prata with anything else like banana, chocolate sauce, cheese. Prata with Egg and curry sauce! Damn nice!! Exactly my point. There is no need to hire an extra help when it is not going to boost revenue. Not like the business is worse off without either.